With four teams in title contention at the start Thursday, the final day of the I-League was not short on drama. Here's a recap of how things unfolded. Minerva began in pole position, their 32 points putting them ahead of NEROCA (31), Mohun Bagan (30) and East Bengal (30). It meant they just needed a win to put the other three out of contention. William Opoku scored the first goal of the day in Panchkula, taking advantage of some slack defending from Churchill Brothers to knock the ball into an open net. Meanwhile, East Bengal had begun brightly against NEROCA, but failed to beat Lalit Thapa in goal. After a sluggish start, Mohun Bagan started getting some rhythm against Gokulam Kerala in Kozhikode, and when Cameron Watson's initial effort hit the bar, the rebound fell to striker Dipanda Dicka, who took his goals tally for the season to 13 and Bagan temporarily to second place. Having soaked up all the East Bengal pressure for most of the first half -- the hosts had Jobby Justin unable to turn the ball into an unguarded net at one stage -- NEROCA's Nigerian striker Felix Chidi got one chance to get one-on-one with goalkeeper Ubaid, and beat him at his near post. Game on, with NEROCA rising to 34 points, and moving within one of Minerva. A first half goal from William Opoku earned Minerva a 1-0 win over Churchill Brothers, helping them seal the title on the final day. With Mohun Bagan pushing forward, they let their guard down in defence during injury time, and Mohammad Rashid was able to head the ball into the path of Ugandan striker Henry Kisseka, who put it past Shilton Paul. This set Bagan back, and also brought the outside possibility of East Bengal entering the equation, provided they could score in Kolkata, and Churchill Brothers could find an equaliser of their own. If there had been one player who had hauled East Bengal back into title contention, it was Nigerian striker Dudu Omagbemi, and he would bring them back into this final day race with a headed goal a little over halfway through the second half. This was brought about by some positive changes in personnel and strategy by coach Khalid Jamil -- Yami Longvah made way for Laldanmawia Ralte, and together with Mahmoud Al Amnah and Katsumi Yusa, East Bengal kept getting the ball into the opposition side of the pitch. 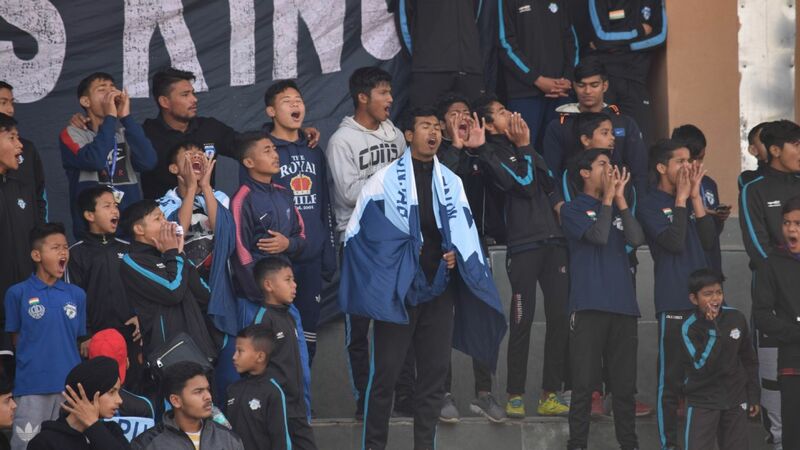 The goal strangely made NEROCA sit back a bit more -- perhaps the debutants realised that losing this match would effectively mean losing their chances of finishing second. The first match to be completed was in Kozhikode, where Kerala defended doggedly till the end and even created some late opportunities of their own to score, earning a 1-1 draw in the end. NEROCA had some late attempts at goal thwarted too, with Ubaid called into action as Subash Singh, Nedo Turkovic and company threw themselves into counter-attacks with gusto. Churchill Brothers, needing a win to avoid relegation, also threw more bodies into attack and started pumping balls into the Minerva box. Goalkeeper Kiran Limbu brought his body into play by advancing a couple of times, and Churchill were guilty of snatching at a few shots. The final whistle came first in Panchkula. Coach Khogen Singh and the rest of the support staff, who were having a hard time containing their emotions once the game had rolled into injury time, rushed on to the pitch to embrace the players. India had their first national champions from Punjab since JCT's star-studded team won the first National Football League 21 years ago.